getting your pets fixed (spayed or neutered) will likely give it a happier and well-adjusted temperament because they will not need to go through heat cycles that change their behavior. They will not get the urge to go out of the house to mate which significantly reduces their chances of being exposed to harm. Spaying and neutering will likely increase your pets life! Their chances of getting breast cancer is also reduced. Chances of Uterine infections and testicular cancer is eliminated 100%. Spaying and neutering will help reduce the number of unwanted pets in your community. The consequences of stray and homeless animals overpopulation is well-known. We all know what happens when homeless animals visit our trash cans, defecate on our properties and bite humans. 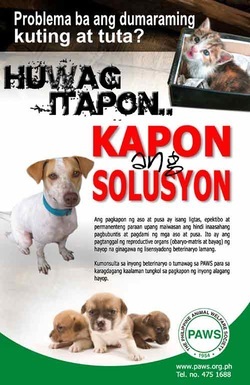 Spaying and neutering help animal welfare organizations and animal shelters because animal shelters are full and there are more homeless animals than there are adoptive homes to save them (this is also the reason we encourage people to adopt rather than buy puppies and kittens for sale in the Philippines). Millions of animals are euthanized in pounds and shelters everywhere because they are unable to find enough homes to take them. Prevent all the death and suffering by doing your part. Spay and neuter your pets. If you're afraid it would cost you money, think about how much more it will cost you if you get a litter of six to feed and take care of. Giving away puppies and kittens to your family and friends does not solve anything because your pet will be capable of creating more soon after doing so. To download an English version, click here. To download a Filipino version, click here.